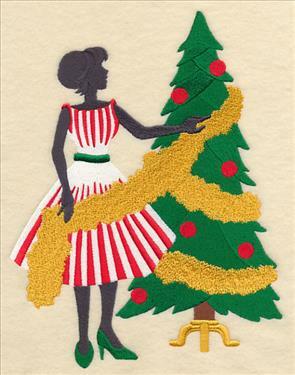 Be the most festive fashionista on the block with this week's new designs: Christmas couture! 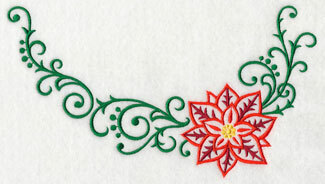 Each of these new designs are terrific for adding style and flair to your holiday stitching. You'll find stylish silhouettes to add to tote bags and pillows, trios and sassy sayings for sweatshirts, and more! 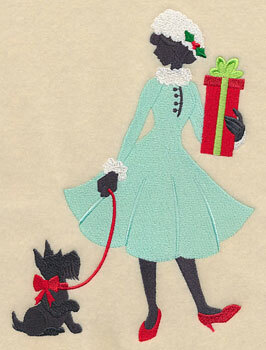 Fashion plate medleys and necklines simply scream style, while animals prints are sure to create fabulous holiday fashions. 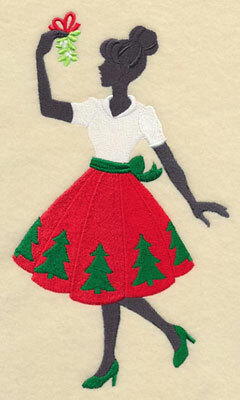 Scroll down the page to see these fa la la festive designs! 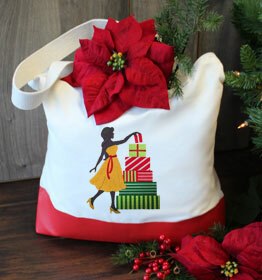 A holiday-friendly tote bag gets a stylish update with this festive fashionista design. 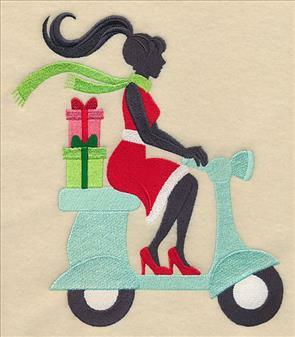 Stylish ladies in silhouette bring a fashionable touch to tote bags, pillows, and quilts. Each of the fa la la fashionistas are dressed to the nines and ready to celebrate the holidays! 6.70" x 7.78" and 5.87" x 6.82"
6.24" x 8.35" and 5.46" x 7.31"
4.90" x 6.56" and 4.38" x 5.87"
Here an on-the-go socialite delivers Christmas gifts on her scooter; a second silhouette is ready to pucker up under the mistletoe. Each of the stylish ladies use bold, contrasting colors to add a vibrant look to your embroidery. 7.32" x 8.42" and 6.42" x 7.38"
4.89" x 8.43" and 4.29" x 7.38"
3.90" x 6.72" and 3.44" x 5.93"
Whether trimming a tree or shopping for Christmas gifts, these sophisticated silhouettes embrace the haute couture of the holidays. 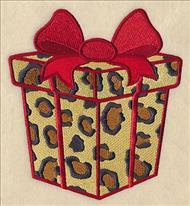 Stitch these embroidery designs on framed pieces, stockings, shopping bags, and more for the fashionistas in your life. 6.91" x 8.89" and 6.06" x 7.80"
3.41" x 8.15" and 2.99" x 7.14"
2.72" x 6.50" and 2.40" x 5.73"
These stylish sophisticates are gorgeous additions to your embroidery collection. 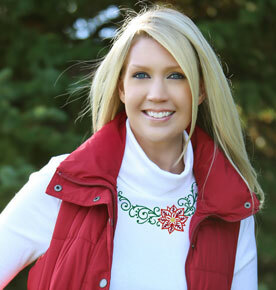 Turn a t-shirt or sweatshirt into a festive-yet-fashionable article of clothing with these holiday necklines. 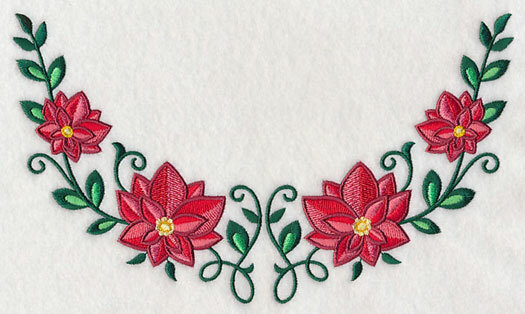 A bright poinsettia bloom stitched off-center is a trendy way to add style to your favorite outfit. See how to position designs on necklines in this tutorial here. 9.40" x 5.36" and 6.88" x 3.92" and 5.25" x 3.00"
5.49" x 5.27" and 4.02" x 3.86" and 3.07" x 2.95"
Cheerful cardinals bring all-natural beauty and glamour to dresses, t-shirts, and more with their bright colors and holiday accents. 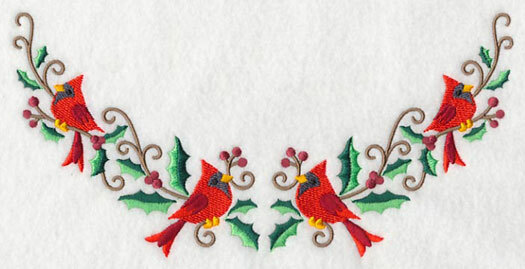 Let the charming birds land on your apparel this Christmas. 9.40" x 4.69" and 6.88" x 3.44" and 5.25" x 2.62"
4.67" x 4.65" and 3.43" x 3.41" and 2.62" x 2.60"
Bright, vibrant ornaments hanging from a satiny ribbon are an elegant and stylish way to update your apparel for the holidays. 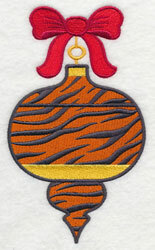 Each of the ornaments features white open spaces, allowing your sweatshirt color to shine through. Learn more about stitching necklines here. 8.42" x 5.87" and 6.86" x 4.78" and 5.25" x 3.66"
4.82" x 5.38" and 4.28" x 4.77" and 3.27" x 3.65"
Gorgeous blooming poinsettias give this fashion-forward neckline design unmistakable beauty and elegance. Stitch the holiday flowers on your new Christmas sweatshirt or shirt. 9.40" x 5.46" and 6.85" x 3.98" and 5.25" x 3.06"
4.67" x 5.46" and 3.41" x 3.98" and 2.62" x 3.06"
Fashion plate designs are modeled after vintage pattern envelopes, and feature a brightly hued figure in the foreground, with a few sketch-style figures in the background. 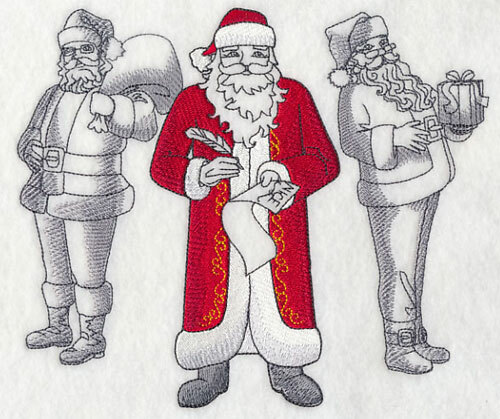 Here Santa is depicted in three different poses -- with his bag of Christmas toys, checking his "Nice" list, and holding a gift. 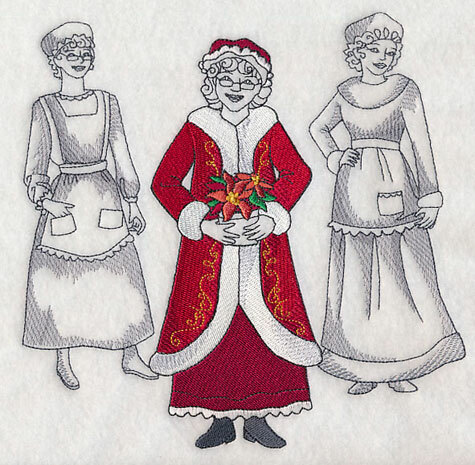 7.80" x 6.60" and 6.93" x 5.86" and 5.73" x 4.85"
Stitch a Mrs. Claus fashion plate alongside your Santa version for a festive pair of fashionable designs. 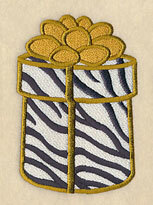 They're a great way to adorn a set of pillows, matching framed pieces, or the two sides of a blank tote bag. 7.78" x 7.63" and 7.02" x 6.88" and 6.01" x 5.89" and 4.95" x 4.85"
The bright, colorful center figure contrasts beautifully with the sketches in the background. 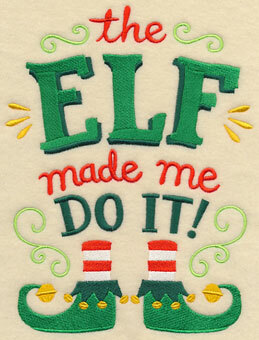 Stitch this mischievous elf on a mini-quilt, fabric gift bag, or on an apron. 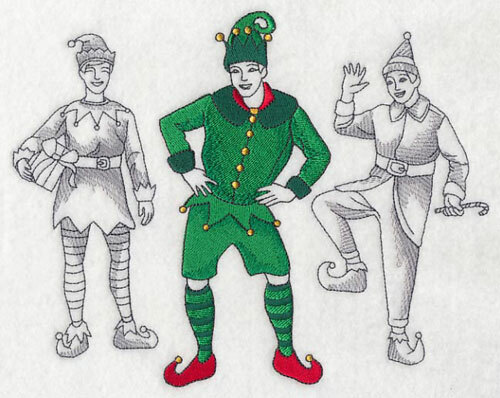 8.66" x 6.89" and 7.36" x 5.86" and 6.10" x 4.86"
In addition to the male elf fashion plate, a female elf shows off her style in this design. 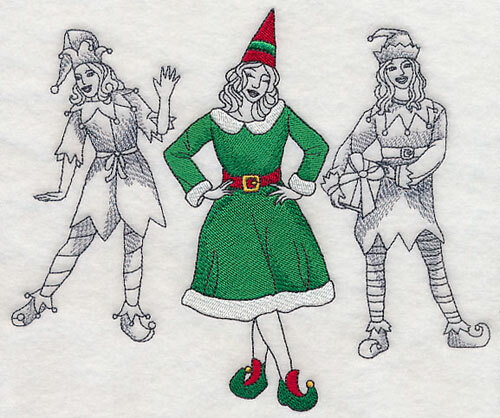 Three variations of her usual winter wear are shown in this holiday motif. 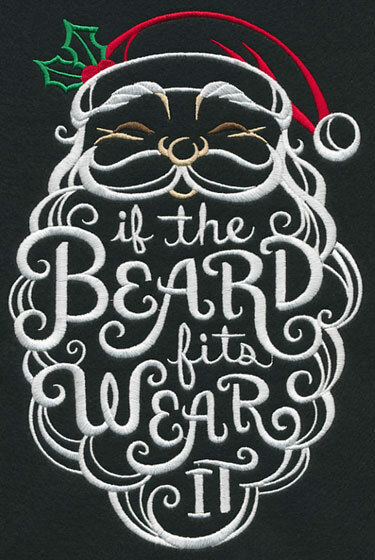 7.78" x 6.50" and 6.97" x 5.83" and 5.81" x 4.85"
Santa is well known for his big, bushy white beard and moustache. 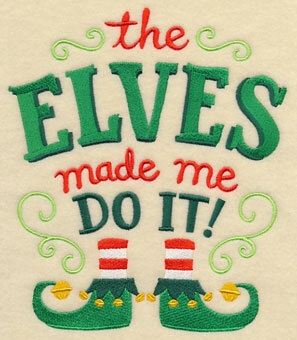 Stitch this funny, Santa-theme twist on the phrase "if the shoe fits, wear it" on sweatshirts, pillows, tote bags, and more. 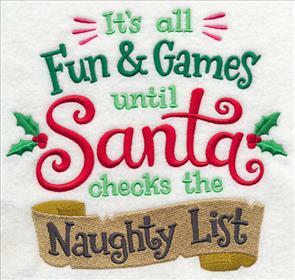 6.89" x 10.40" and 5.81" x 8.78" and 5.17" x 7.80" and 4.52" x 6.82" and 2.58" x 3.90"
Fun and sassy holiday phrases and sayings are a light-hearted approach towards Christmas stitching. 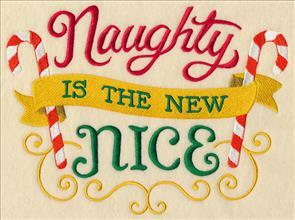 Here, two witty Christmas samplers encourage you to embrace your naughty side this holiday season. 7.38" x 6.90" and 6.26" x 5.86"
9.21" x 6.90" and 7.81" x 5.85"
6.48" x 4.86" and 3.86" x 2.90"
Blame your Christmas mischief on the elves! 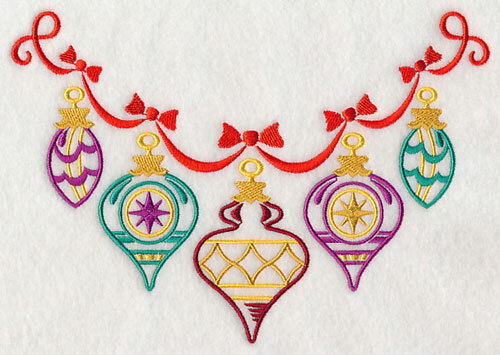 This silly design is a jolly way to add a festive look to your holiday wearables. 6.79" x 7.81" and 5.85" x 6.73"
6.85" x 9.02" and 5.86" x 7.72"
4.86" x 6.40" and 2.93" x 3.86"
This fun saying makes a great addition to t-shirts, sweatshirts, and other apparel. Or, stitch the design onto pillows, mini-quilts, and totes. 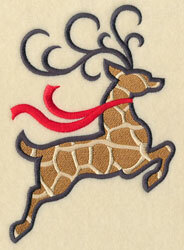 Get more information on stitching on shirts here, or on sweatshirts here. 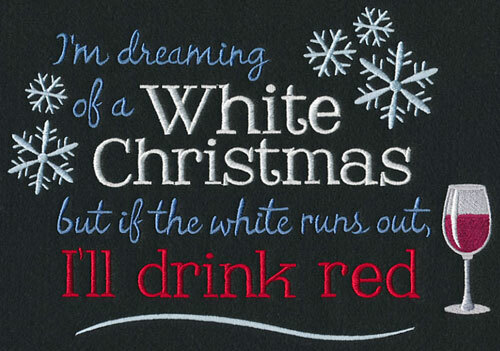 These sweet-yet-sassy Christmas sayings give your holiday wearables extra festive appeal. 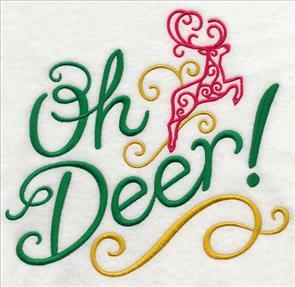 Here, a clever twist on "Silent Night" is fabulous on pajamas and lounge wear; an "Oh, Deer!" 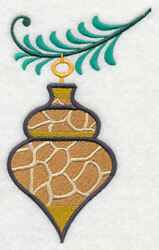 design is a witty way to stitch for the holidays. 7.80" x 7.63" and 7.06" x 6.90"
6.00" x 5.86" and 4.99" x 4.88"
7.81" x 7.29" and 7.40" x 6.90"
6.29" x 5.86" and 5.19" x 4.84"
Wine lovers will get a kick out of this twist on the lyrics to the classic holiday song "White Christmas." 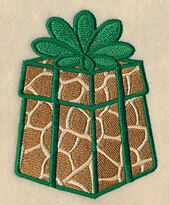 Stitch it on a sweatshirt for yourself, or use it on a hostess gift paired with a bottle of wine. 9.97" x 6.90" and 8.47" x 5.86" and 7.61" x 5.26" and 6.87" x 4.75" and 3.87" x 2.67"
Every fashionista knows the power of a good animal print. 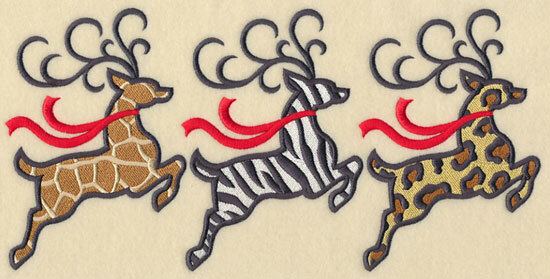 These Christmas trios get an extra stylish edge by featuring classic holiday motifs in giraffe, zebra, leopard, and tiger prints. 11.75" x 5.79" and 9.40" x 4.64" and 7.80" x 3.85" and 6.86" x 3.39"
Each of the reindeer from the wild trio above has been separated out and is available for individual purchase. Pick your favorite print, or stitch in cohesion with the trio design. 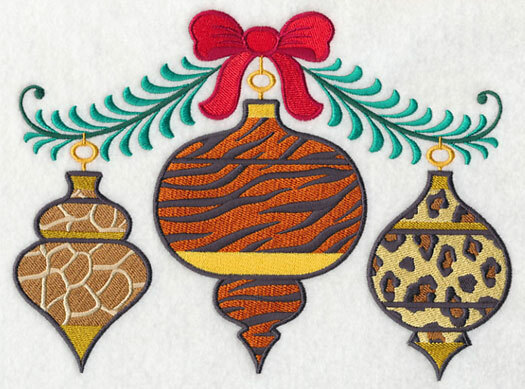 4.68" x 6.87" and 2.65" x 3.85"
Three antique ornaments get a fashionable update courtesy of stylish animals prints. Stitch on sweatshirts, t-shirts, or tote bags. Get more information on stitching on sweatshirts here, or watch our new video! 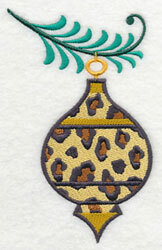 9.29" x 6.90" and 7.80" x 5.79" and 6.56" x 4.87"
These high-fashion ornaments are available for individual purchase. 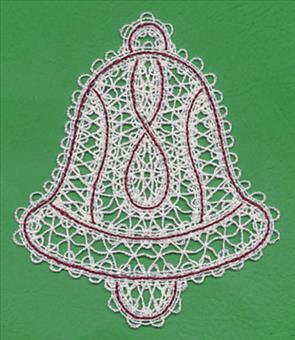 Use them as accents to the trio above, or stitch singly. 3.46" x 5.63" and 1.97" x 3.22"
Trio designs are horizontal in shape, which makes them perfect for stitching on shirts and sweatshirts. 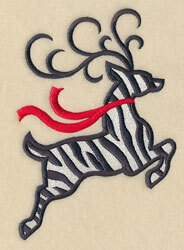 Get more information on stitching on knit shirts here, or on sweatshirts here. 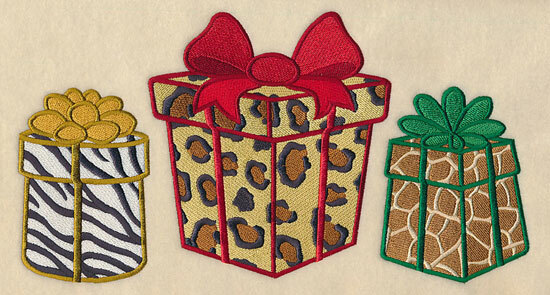 A trio of Christmas gifts in zebra, leopard, and giraffe print are sure to add a stylish look to your next embroidery project. 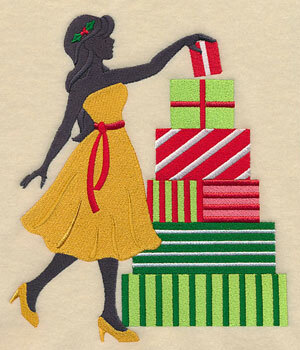 Stitch the wild design on apparel, or add to aprons, tree skirts, or other holiday decor items. 11.75" x 6.35" and 9.40" x 5.09" and 7.79" x 4.21" and 6.85" x 3.71"
Each of the gifts have been separated from the trio, and are available singly. Use them together with the trio for a matching set. 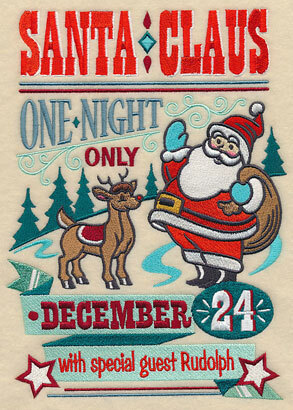 2.75" x 3.63" and 2.01" x 2.65"
Modeled after antique show posters, these Santa Claus designs are a fun and colorful addition to any Christmas stitching! 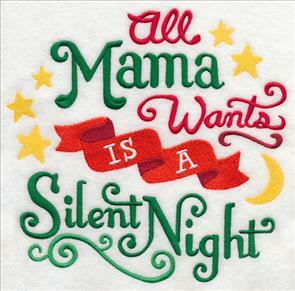 The design is available in two versions: one for Christmas Eve and one for Christmas morning. Stitch on tote bags, pillows, and more. 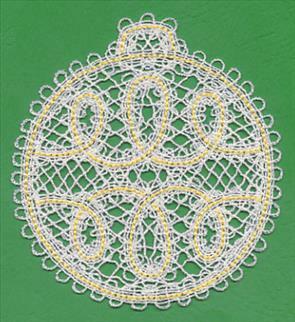 6.84" x 9.46" and 5.65" x 7.81" and 4.85" x 6.71"
Battenburg Lace was developed in the late 1800s and is well known for its use of cotton thread to replicate a hand-crocheted look. 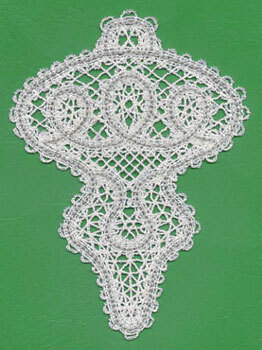 This type of machine embroidered lace is embroidered onto water-soluble stabilizer, which leaves beautiful lace behind when it's soaked away. 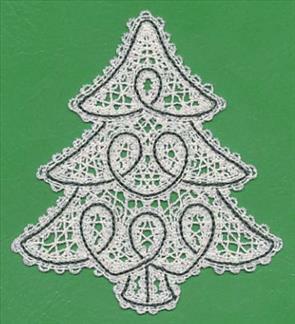 4.80" x 5.80" and 3.22" x 3.88"
Battenburg lace in Christmas designs -- such as a Christmas tree, a star, and ornaments -- is a beautiful way to add a sophisticated look to your holiday decor. 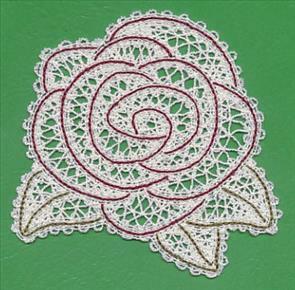 Use as a terrific addition to garments, pillows, and other home decor projects. 4.83" x 6.46" and 2.90" x 3.88"
The elegant look of Battenburg lace makes it a stunning way to add a sophisticated appeal to apparel, dining room and bedroom linens, and towels. 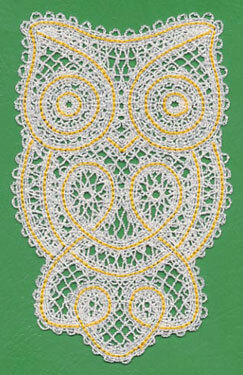 Here a bell and an owl are stitched in the gorgeous Battenburg lace style. 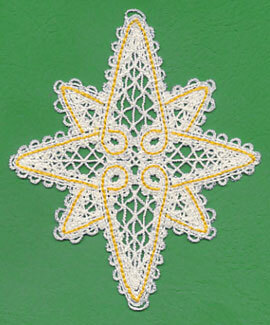 Get project instructions for stitching Battenburg lace right here. 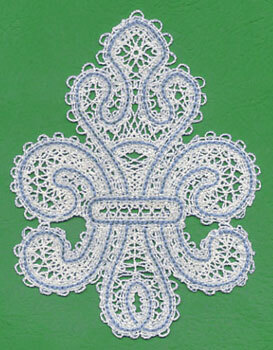 4.35" x 6.85" and 2.46" x 3.88"
A rose and a fleur de lis are elegant choices when stitching Battenburg lace designs. They're beautiful ways to dress up everyday apparel. Use as an accent on a pair of jeans, the back of a jacket, or on a purse or tote bag. 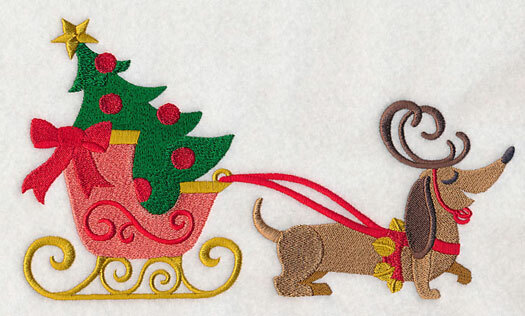 4.86" x 6.40" and 2.94" x 3.87"
A sweet pup takes the place of a reindeer while pulling this holiday sleigh. Lynn is a dachshund lover, and was hoping we'd create the design to add to children's clothing or pillows. What a great suggestion, Lynn! 9.41" x 5.45" and 7.81" x 4.52" and 6.87" x 3.97" and 3.86" x 2.23"